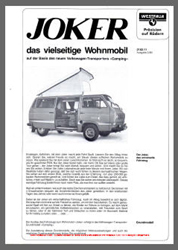 Added a download of an 8 page March 1980 Westfalia Joker Pricelist and Information Brochure to the Air-cooled Westfalia Joker Model History page. Contains prices for all layouts and specifications of van (air cooled petrol models) as well as options and extras available. 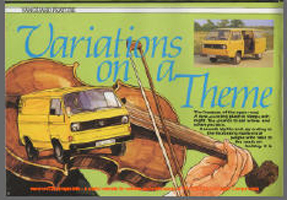 Added a download of a March 1983 VW T25 / T3 Westfalia Continental Magazine Advert to the VW T25 / T3 / Vanagon Westfalia Continental Model History Page. This advert shows the Westfalia T25 / T3 Continental that was imported from Germany and sold in the UK by a company based in Wolverhampton called Travelworld. The advert also states the model was available in either Left Hand Drive or Right Hand Drive. I have also added some photos of what I believe to be one of the original RHD Westfalia Continental models sold by Travelworld. You can see in the photos the green and beige furniture and this model also has a Westfalia poptop roof that has a raised area at the back. 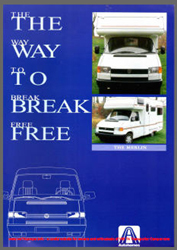 The same roof was also available on the Westfalia Joker 5 and 6 models as can be seen in this brochure . 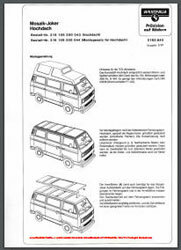 Added a download of a 1987 VW T25 / T3 Westfalia Mosaik Joker Instruction Leaflet (for installing a Wesfalia Hightop roof on your camper) to the VW T25 / T3 / Vanagon Westfalia Mosaik Model History Page. The Westfalia mosaik range consisted of everything that was required for an owner to turn their own Volkswagen T25 / T3 (new or second hand) into a fully fitted camper. It was possible for owners to fit the equipment themselves or to have it fitted at a Westfalia dealer. 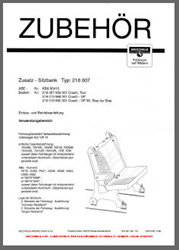 This document will be of interest to any VW T25 / T3 Westfalia Hightop camper owner as it shows just how complex and well built the roof construction is and is also useful for anyone who might need to repair any aspect of the hightop roof. 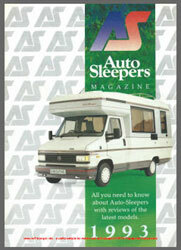 Added a download of a 1993 Autosleeper Magazine (50 pages) to the VW T4 Transporter Autosleeper Downloads Page. Featuring information, adverts and photos of the VW T4 Transporter Autosleeper Trident, Trooper and Clubman GL, Ford Frisky and Flair, Renault Rimini, Rapport and Recro, Talbot Harmony, Rambler GL, Talbot Symphony, Talbot Talisman GL and Talbot Executive. 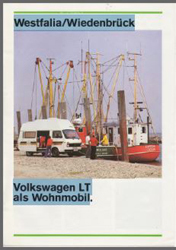 Added a download of a Dec 1994 VW T4 Transporter Autohomes Merlin Sales Brochure to the VW T4 Autohomes Merlin Model History Page and VW T4 Autohomes Downloads Page. The brochure includes information on the VW T4 Autohomes Merlin Motorhome including engine options and specification. Site Update – VW T25 Transporter Autohomes Camper Info Site, VW T25 Transporter Devon Camper Info Site, and VW T25 Transporter Danbury Camper Info Site. 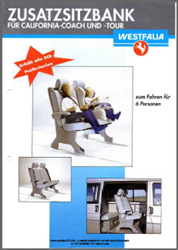 Added a download of Nov 1998 VW T4 Westfalia California Instructions for installation of an extra seat bank (available as an optional extra) to the VW T4 Transporter Westfalia Downloads Page. This is in the German language (Deutsch). 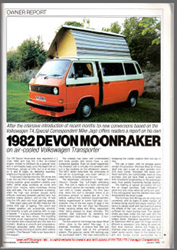 Added a download of a February 1983 VW T25 / T3 Westfalia Joker USA Sales Brochure and Price List to the VW T25 / T3 1983 – 1986 Westfalia Vanagon Camper Model History page. I am guessing that this model was an export model to be sold in Germany to the many US servicemen that were based there and then exported to the USA when the servicemen returned home. This model had 110 volt electrics and city water connection as would be required in USA. 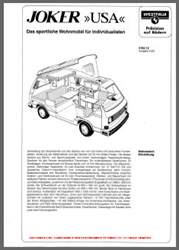 Added a download of a rare 8 page colour Aug 1978 VW LT Sven Hedin Sales Brochure in German Language to the 1978 VW LT Westfalia Sven Hedin Model History Page.